This year only 16 students from Africa were awarded the Master Card funded scholarship for EARTH University and one of these 16 was our very own Shewarega Kibru! This is absolutely fantastic news and will change his life in ways he will not yet be able to comprehend. Today he just received his first ever passport which will be taking him to Costa Rica in August to begin his intensive Spanish courses before starting his degree in January. Each student is offered a Master Card scholarship worth $126,730 that will fully support them through their 4.5 year course. It’s an agriculture and sustainability focused university and students leave after 4 years with a degree between a Bsc and Masters. Once graduated, students will return to their home country to do incredible things helping change the way the environment is treated while improving the lives of rural farmers around the country. The list of exciting jobs Shewarega could get after this degree is too long to list but we can’t wait to find out where he ends up. This scholarship could not have gone to a more hardworking, dedicated and deserving student. Shewarega put his heart and soul into his application and absolutely shone during his intensive assessment and interview day. Over the past year I have personally seen Shewarega grow in confidence while becoming an important part of the EEF hostel and he is more than ready to take on this next chapter in his life. Things weren’t easy growing up; his mother died when he was only 8 and Shewarega took on the adult responsibility of supporting his 2 younger siblings as well as his father while also continuing with his education. Unfortunately with his poor health and low income as a gardener his father found it impossible to support all 3 children and soon had to make the heartbreaking decision to split up the family. He sent Shewarega’s brother and sister to live with different families where they still to this day work as house help. Shewarega being the oldest stayed with his father helping him at his job after attending school each day. He would study late into the night before getting up early to start all over again. He had determination and drive and through all this he was achieving so high in class that his director nominated him for the EEF scholarship. Since he joined EEF Shewarega has been one of the more quiet students but is always friendly, hardworking and never fails to have a big smile on his face. We all know he will absolutely shine at EARTH and we can’t wait to see the difference he makes when he returns to Ethiopia in 4.5 years time. We are so excited for him and look forward to following his story. To keep up to date with all of our students progress follow us here and on our Facebook. If you ever want to help any of our current or future students achieve great things like Shewarega then please visit our website where you can find out more about the program EEF offers. Once more one of our students has achieved above and beyond and once more we get to send out the biggest congratulations. This time the celebration is in honour of one of our grade 12’s, Yohannes, who has achieved the remarkable. Today, after months of application writing, interview prepping and a grueling ‘Candidate Weekend’, Yohannes has heard back from New York University Abu Dhabi, and the news is good. Very good. He has been accepted! And the icing on the cake? He has been awarded a fully funded scholarship worth $300,000. I don’t think you can ask for much more than that? This is an incredible feat; this year the Abu Dhabi campus of NYU alone received over 10,000 applications and accepted only 299 students for the class of 2020. The interview process involved Yohannes travelling to Abu Dhabi for the weekend where he was interviewed, quizzed and observed throughout his exhausting 2 days there. The competition for a place was incredibly strong and the applicants all outstanding; to be accepted is amazing and we couldn’t be happier for Yohannes. He will be flying out in August to join the other 84 nationalities being represented on campus this year where he will begin his degree in Computer Engineering. Yohannes had a tough start in life; his mother died when he was young and his father was left to look after him and his 4 siblings. He always preformed well at school but his primary school was an hours walk from his small village and there was no secondary school in sight. 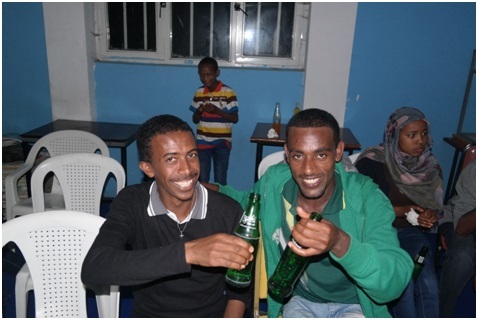 One day his older brother decided to head to the capital Addis Ababa to look for work and a better future; Yohannes at the age of 11 was already dreaming big so joined him. In the city things were tough and full of similar stories; young kids coming from the country side dreaming of a better life. Yohannes and his brothers first experience of the city were spent on the streets fighting to survive, finding their next morsel of food being their only aim. He got a lucky break when a local NGO took him in offering food, shelter and the opportunity for Yohannes to once again attend school. He excelled in class and in grade 8 was offered the chance to apply for the EEF scholarship; we all know the rest of the story from there. Yohannes had a dream, and even through the darkest times kept going and look where he is today. We are over the moon for him and wish him all the best at NYU where we know he will make the absolute most of this new challenge and exciting, life changing adventure. Yohannes you are a star, here is a massive ‘Well Done‘ to you from your EEF family! Keep following us here and on our Facebook page to keep up to date with all of our student’s successes and adventures. 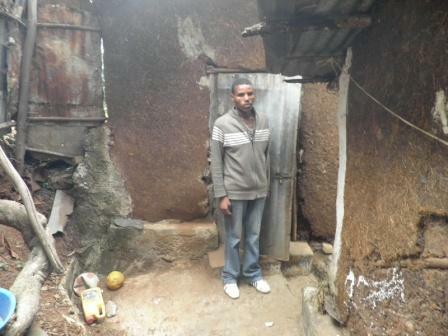 Do want to help a student like Yohannes dream big and reach their full potential? Find out how by visiting our website. It’s been a long road and a lot of hard work but here we are, the week where we made the final decision for next years scholarship students. 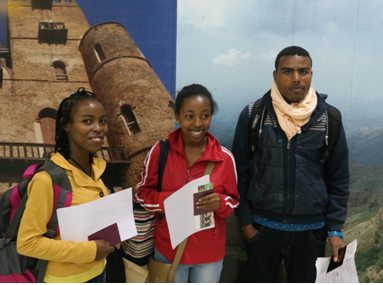 From over 150 applicants we were left with 20 hopeful students from both Addis Ababa and Gambella – a city in far western Ethiopia. From these 20 we choose between 10 and 14 students who will enter the EEF hostel next year and begin their grade 9 studies at School of Tomorrow. If you have been following our recruitment process you will know that these students have already sat 6 hours of exams, completed long application forms, had their homes visited and been through rigorous interviewing from us, the EEF managers. The final stage is no easier and this time we throw the 2 EEF directors, Glen and Achim, into the mix who have flown out from London for the occasion. 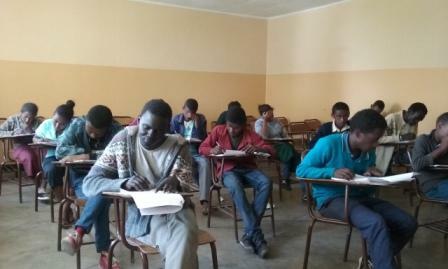 Over the week the final 20 students came to the hostel where they sat another exam, wrote another essay and took part in group and individual interviews with the EEF managers and directors. I’ve said it before and I will say it again – this is a tough process and we don’t make it easy. These scholarships must and will be handed out to the most deserving students; and of course it’s not an easy decision, in fact it’s one of the hardest. The chosen 14 were invited to School of Tomorrow where they had to give one last presentation while under the impression we were only handing out 8 scholarships that day. For us this is a day of mixed emotions, we all had our favourites that we were rooting for and we have had to say goodbye to many a bright student along the way. We have dug deep into their lives and know them well. We will however, rest easy knowing we have made hard decisions but good decisions. After presentations and general Simon Cowell tom foolery all 14 students now knew that their lives had just changed forever. We then together made the short walk back to the hostel were they were greeted into their new home and family with open arms and huge amounts of enthusiasm from our current students. Saturday evening was a party of goodbyes as the directors flew home, welcomes and over all congratulations to all at EEF. This was a time for the students to let their hair down and showcase their talents in front of both the EEF and School of Tomorrow clan. New students danced with the old and there were all round smiles lighting up the room. It really was quite the event. So there we have it, 5 months after we began the recruitment process 14 new members of the EEF family are waiting to move in to the hostel in September and we are delighted! Some are still looking for sponsors – If you are interested in sponsoring any of these fantastic students please contact Achim Kram who will be more than happy to answer any of your questions. These students are incredible and they make amazing things out of their lives, but they can’t do that without your help. The trees are up, the decorations out and everyone is in the holiday spirit…. I know what you are thinking and no, I haven’t been slacking off over the festive season hoping you don’t notice how late this blog is. While you’re packing away the Christmas decorations, clearing up the last of the New Year streamers and preparing to get back to work, our festive period is just beginning. Here Christmas is celebrated on the 7th of January…you may have noticed by now we are always a little behind the times. The students get a well deserved week off school where they take time to catch up on studies, give the hostel a serious scrub down and most importantly visit their family and celebrate the festive season with them. Very similar to a Christmas back home really; food, food and more food, also luckily for us new year passed in September so no dull weight loss resolutions to follow…oh ok just one more helping of Injera then…. So here’s to Christmas round 2! We hope your festive season was as full of joy as ours! 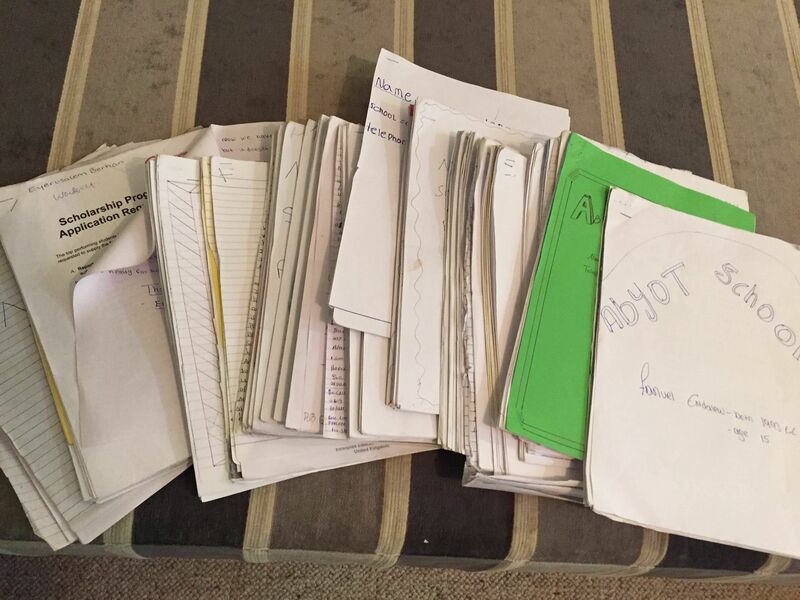 So far 140 students have been nominated by their schools and sat 6 hours worth of exams in Maths, English and Physics; of these 58 were selected to write an application for us, telling us about their life and academic achievements. All have now been read and from these we have chosen 27 students to pass through to the next stage. Ever wanted to know what 58 scholarship applications looked like?! We warned you in the last blog about our recruitment stages…this is a long and arduous process that we do not take lightly. We want to make sure every single student is given a fair chance at getting this scholarship and we want to make sure the final 10 are the ones most in need of it. This is why our process is long and in depth; we are digging deep into the lives of each student that applies and we want to know all. So the next stage I hear you ask? What is it all about? Well we now know the academic level of these students, and their applications have outlined a little about their life and their living conditions but sometimes seeing is more explanatory than words. So now we are going to visit each of the 27 selected students’ homes. We have put aside a month for this task, but it could take longer. We get led into the unknown during this stage and how long it will take is anyone’s guess. We know where each student goes to school, but their houses could be anywhere. Some students may live just next door but many will walk miles for an education. I feel maps won’t help us here. The students are our guides and will lead us to their homes and into their lives. So for now we head off the grid into the homes of the hopeful 27….the select few chosen from this stage will then be up in front of EEF’s very own directors, Achim and Glen, who will visit Addis in January. We are getting closer and closer to having our final 10 chosen for next year. This opportunity for the students is life changing but we can’t change lives without your help. 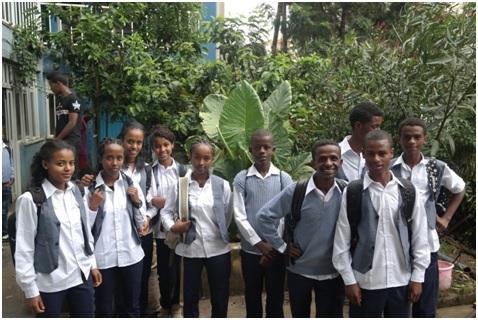 We will soon be looking for sponsors for these chosen students; the sponsorship of each individual student helps clothe, feed and provide school fees so they are able to attend one of the best private schools in Ethiopia. This opportunity gives each and every one of our EEF students hope for the future. University which was once a distant dream suddenly seems in reach. Three healthy meals a day are always on the table, getting four years of top quality education is finally a reality. You can read about some of our current university students here to see how their lives changed after joining EEF and here to see what jobs our graduated students landed after university. Keep checking back here and on our Facebook to see who our new 10 students will be; we expect higher viewer ratings than the final of X Factor…possibly. 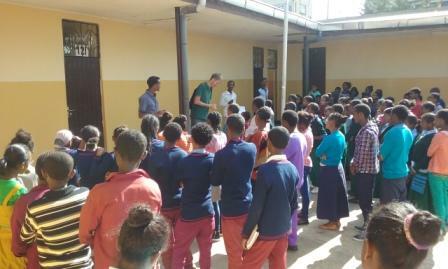 If you are interested in joining the EEF family and sponsoring a student or want to just find out more please do not hesitate to email Achim Kram at achim @ ethio-ed.org . You can take the girl out of Ethiopia but can you take the Ethiopia out of the girl? Remember Kalkidan? If you follow us on Facebook, you may well remember a very congratulatory post last year…Kalkidan managed to secure herself a fully funded scholarship to attend one of the top Universities in the world…NYU Shanghai. We were so proud of her and we still are so I thought this week I would catch up with her and see how life is treating her in China. Kalkidan had a tough start to life; she spent most of her free time helping her mum out, even more so after her dad up and left them. In grade 8 finishing high school seemed very unrealistic for her; University was not even on her radar…until her hard work and perseverance paid off and led her school director to recommend her for our EEF scholarship. It was an absolute delight to have her living at the hostel for the 4 years she spent with us and we knew she would go far. When she first joined we didn’t know quite how far though…but we soon found out. In grade 9 we knew she had potential to do very well on the EEF programme and once provided with a stable environment to focus on her studies, we realised she really could achieve great things. So after she acheived straight A’s in the grade 10 national exams, we suggested she was the perfect candidate for NYU and she jumped at the chance. NYU is one of the most sought after Universities to attend, the competition to get a place is fierce; last year 60,000 students worldwide applied, out of that Shanghai accepted only 150 students ….when I said fierce competition I meant it! Kalkidan did amazingly well to get accepted and then to top things off the University granted her a fully funded scholarship worth $60,000 a year. This was an amazing feat and we could not be happier for her. So she has now been there a few months and I wondered how this amazing adventure was panning out for her. ‘I miss enjera so much, no food can replace enjera, it will always be my number choice’. 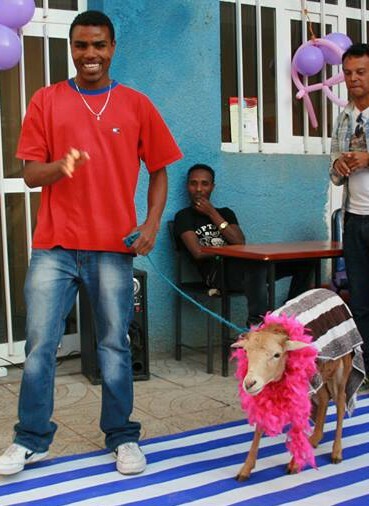 You can take the girl out of Ethiopia but you can never take the Ethiopia out of the girl. ’Shanghai is a very big city and Chinese people are very helpful, and kind. There were times that I took the metro to go to the campus but I couldn’t find the line or the closest exit, people at the metro helped me though I can’t speak Chinese, they are very good at understanding sign language. At the supermarket they can know the things I am looking for without me telling them, so I am confident to go to places by myself’. She is incredibly busy with settling in and focusing on her studies at the moment but she will soon explore the city and country more; with a 4 year degree ahead of her time is on her side. 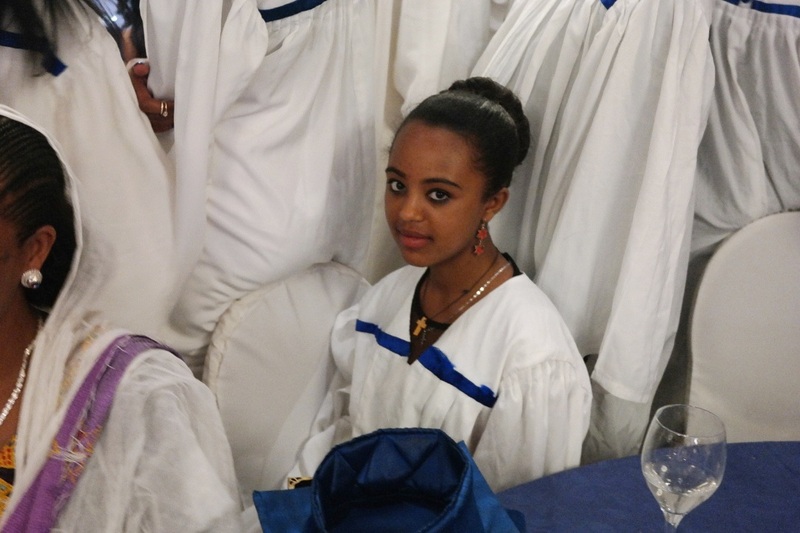 Then of course the studies; this is a huge transition, moving from Ethiopian education to a world class University; a small example of the difference she gave – in Ethiopia she got one month to finish an assignment, NYU allows just one week. Moving to a new country can be overwhelming, but to start your studies straight away too…well… she has been thrown in at the deep end and I’m not sure she has had time to come up for air yet. But this one’s a fighter and I am certain the more she settles and gets used to her new environment the easier it will become for her. She’s also positive this will be the case! ‘NYUSH is like a sample of the world, there are many people from different places. I hear so many languages being spoken everyday, It is so diverse’. So over all how did joining EEF influence her life? And what does she miss most? The EEF hostel of course (and I don’t think she was just saying that!). So I would say another great success story, one of many, for EEF and our students; we are constantly a very proud family. The 100 grade 8 students stood with us today have been carefully selected by their school to be in the running for next years EEF scholarship places and the first part of this process is a set of rigorous exams covering Maths, English and Physics. These 6 hours could change their lives forever. 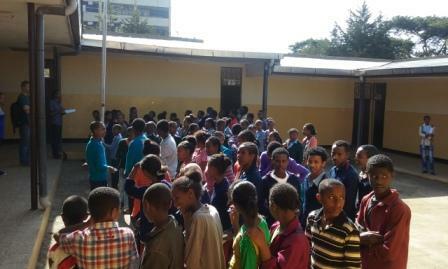 If they do well they will be one step closer to being accepted into EEF next year; this involves them moving into the hostel with full financial support and getting a place at one of the best private schools in Ethiopia. Today was just the beginning of our long selection process where out of these 100 students we can only pick 10 to join us next year. Over the coming months the students who pass the exam will fill out in depth application forms, show us around their homes and be interviewed on a one to one basis. By the end of this process we will have a vivid picture of each students life and will be able to make an informed and accurate decision about who will be offered our limited places. This is a long and intense process for all of us at EEF as well as for the students involved; it’s probably pretty nerve wracking for them too! It is an exciting and busy time and we are eager to get these exams marked and head into the next stage of our recruitment process; keep following us here and on Facebook to keep up to date! Happy New Year and Welcome New Students!! This month we see in the New Year…2008. Yes we may be a little behind the times but things are always progressing forward at the hostel. September, as always, is a busy month for us. 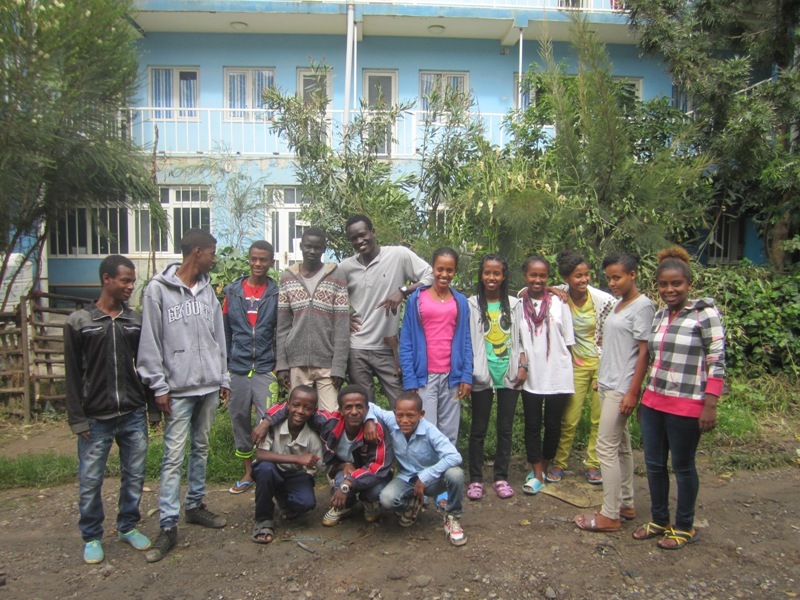 We welcome in our new grade 9s who begin their 4 year stint at the hostel and we also begin our search for the new students who will join us the following year in 2016 (or 2008 if you are working from the Ethiopian calendar). This is always a very exciting time for us. It’s the time where we get to meet the new students whose lives have literally been changed through them working hard and getting through the School of Tomorrow and EEF rigorous selection process. As they arrive at the hostel they get paired up with their older student who will take them under their wing and show them the ropes. 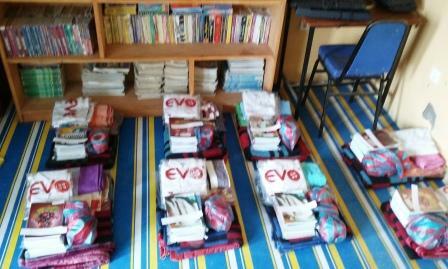 We give them their bed sheets and toiletries then let them settle into their new rooms. 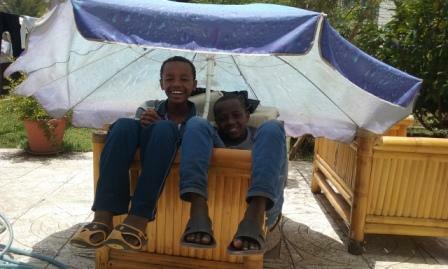 Before they start at their new school they have some time to relax, adjust and get used to their new home. Over the coming months and years we will see these young new students grow, develop and flourish with EEF supporting them every step of the way. This is also when we start the selection process to find new students to join us in the next school year. This is a long and thorough process where we make sure we are taking on the most deserving and in need students who we know will progress through the programme and come out the other side a success. It’s never easy choosing one over the other, each one with their own story and needs; but someone’s gotta do it. This year we will be witling down around 200 students to just 10, we are looking for the best of the best. And next year…they will be entering the hostel all wide eyed and bushy tailed ready to start their own journey with EEF. So as we see in the New Year we welcome our new students to the EEF family and wish them the best of luck over the coming years; we are sure they will succeed, reach their full potential and make every one proud. You can follow the journeys of all our students on our Facebook and also find out more about what we do out here on our website where you can read each individuals students profile. Also please follow this blog to get regular updates from life at the hostel. This week is the big hostel spring clean; summer school is over, exams are done, report cards are in and now….relax. But first we clean. In a few days our new grade 9 students will arrive. We have been busying ourselves with buying their ‘hostel starter packs’; on arrival we arm them with bedding, toiletries, exercise books and uniforms ready to start life in their new home and at their new school. We also want everything to be spotless and perfect for them so now it’s all hands on deck and everybody is ready to get scrubbing. EEF functions as a big family where everyone chips in around the hostel with all tasks both big and small; and this family is excited to soon be welcoming in their 11 new members so it’s time to get to it and make the place shine for them. They were probably hard at work earlier…when we weren’t looking…. 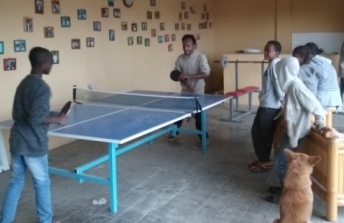 The next 10 days is also a rare chance when our students get a break from study so, once the cleaning is done, its football and table tennis tournaments all round. A well deserved rest before getting back to the hard grind when the new school year begins. And then they were off to Costa Rica…. The flights are booked, the visas confirmed, the bags are packed and finally the day they have been counting down to has arrived; departure day. Today we are very proud to be waving goodbye to 3 of our EEF students who are jetting off to pastures anew…. 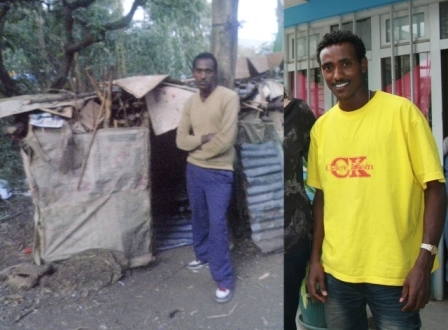 5 years ago today Solomon was studying by day and working by night in Ethiopia’s capital city; Addis Ababa. He had moved from his home town of Atura 500km away to live with his aunt in the capital on the promise of being able to go to school; she soon tired of him not bringing in any money and before he knew it Solomon was left to find his own way in the unfamiliar city. Solomon is a big believer in following dreams and his dream was firmly etched in his mind and he wasn’t going to detour from it. He rented a small place to live and worked to earn enough money to pay for his education, sometimes eating just one meal a day so he could afford rent. 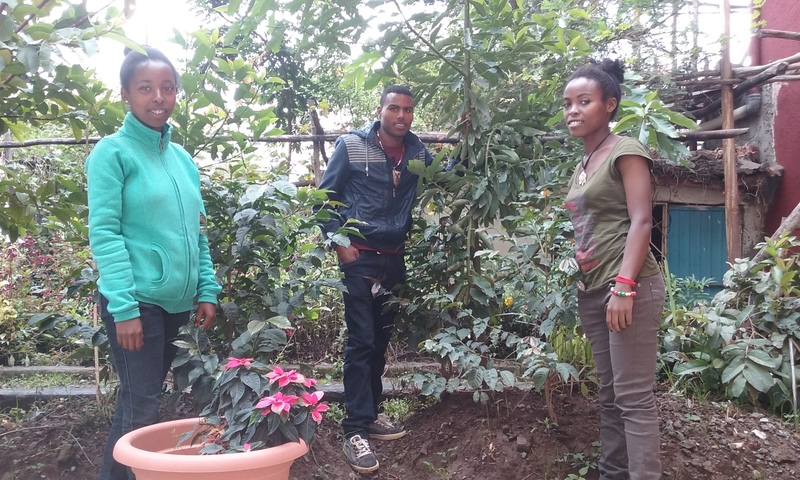 Getting out of his home village of Atura to continue his education was a challenge in itself but flying solo in Addis at the age of 13 whilst trying to further his education was near impossible. But Solomon had a plan and he was sticking to it; however, his dreams probably didn’t include flying to Costa Rica to take part in a 4 year fully funded degree in natural sciences; this would have been such a far cry from his reality that it probably wasn’t even a fantasy. 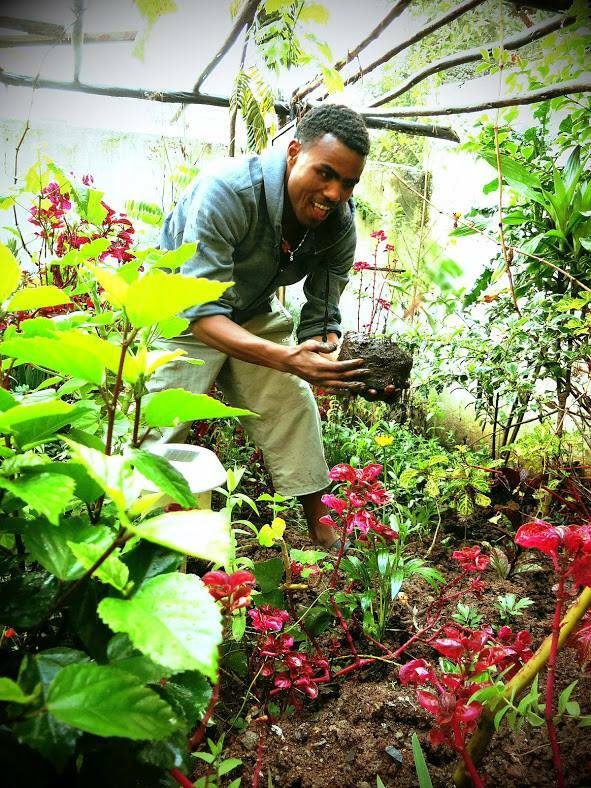 His 12 year old self dreamt of working to protect the worlds natural resources and helping the people of Ethiopia obtain a sustainable lifestyle through farming and this is the dream he held onto to get him where he is today – standing in Bole Airports departure lounge ready to board his plane to Costa Rica to undertake a 4 year degree in Natural Sciences at Earth University. Solomon joined EEF in 2011 and was accepted onto the rigorous School of Tomorrow programme; he found this a challenge from the word go – the elite private education system being very different from the government education he had been following up until now. However, he strived forward and when the opportunity to apply for the Earth scholarship was proposed he jumped at the chance. Without the help and support of EEF we are sure Solomon would still be following his dream to work with the environment however the struggle to keep this a reality would have been very real. EEF provided him with the platform to follow his calling without putting his health and welfare at risk. 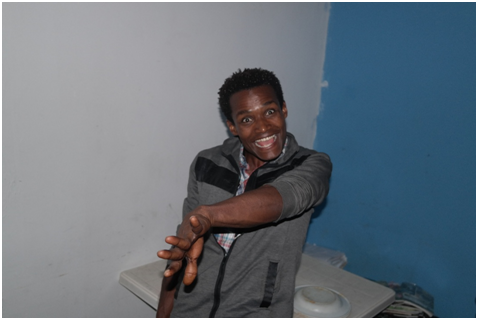 I spoke with Solomon a few days before leaving the hostel and I get the impression this will be a very emotional goodbye for him. He is incredibly excited to get to Costa Rica to begin his education there which will include a 4 month intensive Spanish course. However, he will miss his family, the friends he made at EEF and Ethiopia…and don’t forget his one love, Injera, that he will miss the most. I wouldn’t be surprised if his suitcase is full of the stuff. EEF and School of Tomorrow helped him develop as a member of a community and gave him the education he so wanted and in the process he didn’t just make friends, he made a family. And the plan after Costa Rica? To spread his newly learnt knowledge of course. He wants to return to Ethiopia to teach people how to conserve and protect the natural environment – something many of us need a little education in. He wants to bring his knowledge to not only Ethiopia but the world. Dream big! And so here we are today, at the airport, saying goodbye for now to these three remarkable students who have worked their socks off over the past 4 years and deserve every single success that will no doubt come their way. So we wish them luck and hope they find some time during their exciting new adventure to send us a post card or two from the sunny shores of Costa Rica! This year we have students heading to both Costa Rica and China; do keep checking in to hear how they are getting on!